We create unique and made to measure slide wardrobes to create efficient storage space and additional living space. We will visit you in your home and discuss your ideas, the materials and colour scheme you require, which fixtures and fittings you have in mind and above all, listen to your dreams. All prices include delivery and installation throughout London. Installing a fitted slide wardrobe in your bedroom will give you an increased functionality due to the increased efficiency of storage of your clothing and items. It will also free up other space in other rooms with a sloped ceiling, for example, many people have the idea to turn their spare bedroom into an office, or as a storage room. Choose from a plethora of colour shades and materials to meet your allocated budged and complement your bedroom interior design. See our gallery of sliding door wardrobes to gain inspiration. 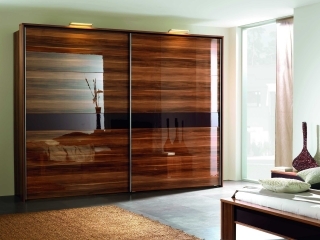 What Are the Long-Term Benefits of Installing a Made to Measure Sliding Wardrobe? Having a bespoke fitted slide wardrobe also has the added benefit of increasing your property's value should you be considering to sell your house. This is particularly the case in London where increased space is highly valued. There are many kinds of wardrobe that one might end up using in a given area, but choosing one that fits the space perfectly or is designed for the kind of room in which it will ultimately be used is the best way to go. Dramatically improve your living space in lofts and attics that are irregular in shape by installing custom made bespoke wardrobes. Every wardrobe also comes with a ten-year guarantee so you can have peace of mind. From experience, we know that our products surpass a decade to provide a lifetime of use. See corner fitted wardrobes and walk in wardrobes.